Performance never looked so good, or so dark. The Suzuki Boulevard C90 B.O.S.S. rewards you with a striking combination of blacked out styling and heart-pounding performance, thanks to its 90 cubic inch, fuel injected, V-twin engine. Along with the aggressive Blacked Out Special Suzuki (B.O.S.S.) styling and stunning performance, this bike features a spacious riding position and large floorboards for comfortable cruising, matched by precise, agile handling provided by its rigid chassis and advanced suspension. The appeal of classic styling is combined with the bene?ts of modern performance, with the steel-tube frame comfortably carrying the rider and con?dently housing the powerful engine. The styling incorporates a muscle cruiser visual statement: rich paintwork, blacked out suspension and chassis components plus deep front and rear fenders with flared ends. 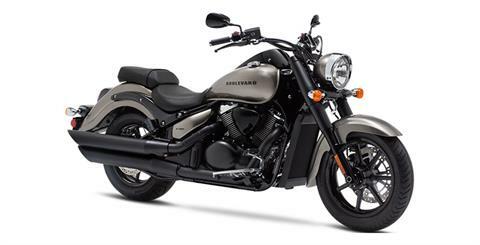 Additional cruiser-friendly features include well-positioned footboards, 4.8-gallon fuel tank and shaft drive. Design engineers focused on creating an ideal rider’s triangle – footboards, handlebars and seat positions set to deliver classic control with outstanding comfort. Both rider and passenger seats are made for comfort and top-notch control. They allow freedom of movement, accommodate riders of different sizes, and are well cushioned. A beefy 16 inches rear tire and complementary 17 inches front tire have wide foot-prints and are mounted to black, cast-style wheels for a power cruiser look. Sculpted engine features blacked-out engine and air cleaner covers that complement the visually striking cylinders with symmetrical cooling fins. The four-valve cylinder head with overhead camshafts and dual spark plugs increase combustion efficiency to help ensure seamless throttle response, gutsy low-to-mid range output, better fuel e?ciency, and reduced emissions. To maximize air induction for best power and torque, the C90 features a unique system that uses three separate air-cleaner boxes feeding the engine. This air induction system increases engine output without sacrificing style or fuel tank capacity. 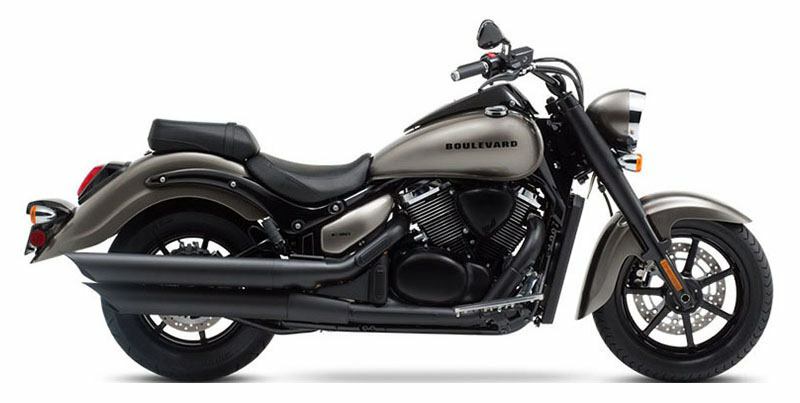 Blacked-out, dual-exhaust system mounted on the right side of the engine is tuned for responsive torque delivery providing a deep, rumbling exhaust note.